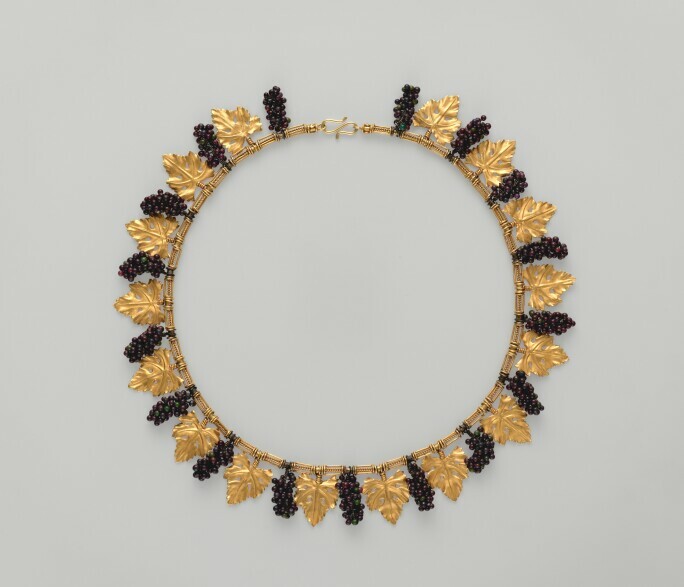 The Metropolitan Museum of Art’s current exhibition, Jewelry: The Body Transformed (through 24 February) asks the simple but profound question: why, across cultures and millennia, do we wear jewelry? Showcasing dazzling ornaments from Ancient Egypt to today’s runways, the proposed answers are as nuanced as they are mesmerizing. S tepping into Jewelry: The Body Transformed, the visitor is greeted by a forest of larger-than-life, vertical vitrines, brilliantly lit and holding displays of equally dazzling and unique jewelry. Individually, each vitrine contains a category of body adornment, with the height of the pedestal set roughly where the object would be worn in relation to the body; anklets near the ground, and necklaces at throat level. Together, when looking through each transparent vitrine, they visually stack to create an idiosyncratic collection of adornments correlating to the body—one sees a complete collection of bodily ornamentation. Crown of the Virgin of the Immaculate Conception, known as the Crown of the Andes, ca. 1660 (diadem) and ca. 1770 (arches). Gold, repoussé and chased; emeralds. IMAGE COURTESY OF THE METROPOLITAN MUSEUM OF ART. 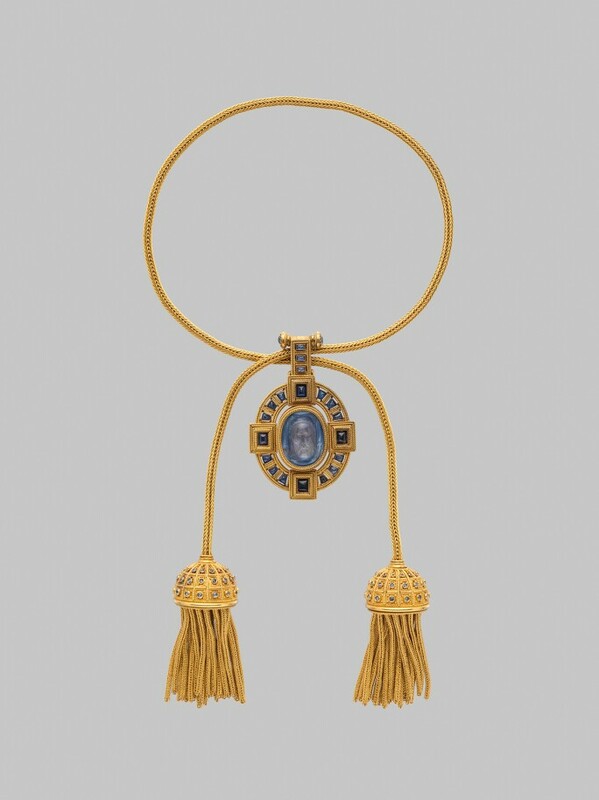 Firm of Castellani, Necklace with cameo of Veronica's Veil, ca. 1870. Gold, sapphires. IMAGE COURTESY OF THE METROPOLITAN MUSEUM OF ART. 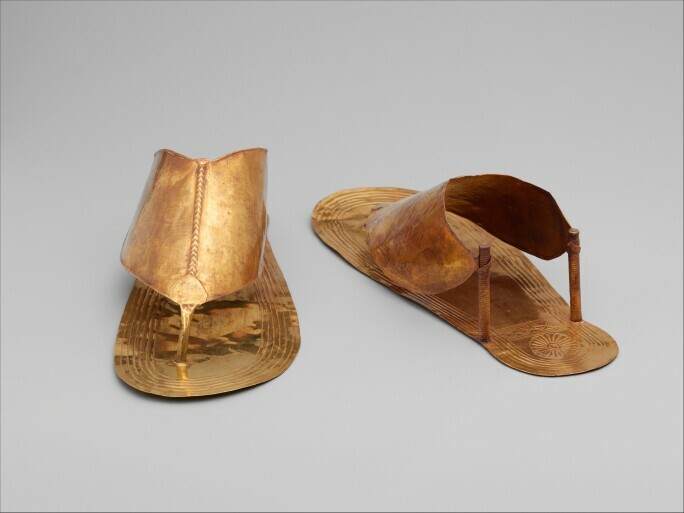 Sandals, circa 1479–1425 B.C. New Kingdom, Dynasty 18, reign of Thutmose III. From Egypt, Upper Egypt, Thebes, Wadi Gabbanat el-Qurud, Wadi D, Tomb of the 3 Foreign Wives of Thutmose III. Gold. Fletcher Fund, 1922. Image courtesy of the Metropolitan Museum of Art. Activation and transformation are the crux of the several thematic divides of the exhibition, which explore jewelry’s role in everything from death to divinity to seduction. In the first section, titled The Divine Body, many of the featured pieces were found buried with their owners, indicative not only of their journey to the next world, but the mythologies they ascribed to. Despite their symbolic meanings, the connection to body, both the wearers and the viewers, is brought to the fore. In one instance, an elaborate set of Egyptian burial jewelry is displayed laid out in proportion to wear it would be worn, a replete set from golden sandals and toe stalls to a scarab beetle necklace. Bodily imperatives are also invoked through the physical space of the exhibition; funerary jewelry ca. 2600–2500 B.C. from Mesopotamia is displayed in a case that must be approached through a low-ceilinged entrance, alluding to the sense of archeological discovery. Elsewhere in the exhibition, jewelry is shown as worn on truncated, specially milled models cast from Classical sculptures currently in The Metropolitan’s own collection. Rather than simply presenting each object in isolation, there is a constant reminder that each piece was, and made to be, physically worn. 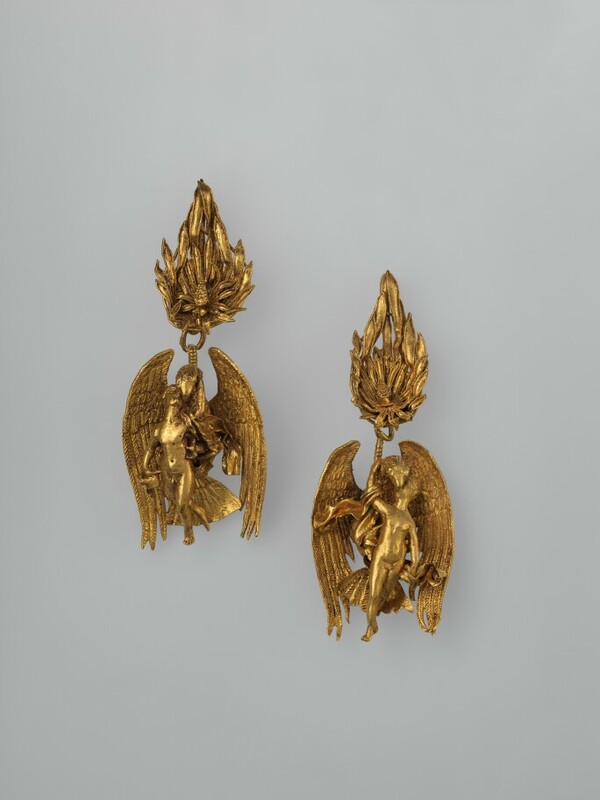 Pair of gold earrings with Ganymede and the eagle, ca. 330–300 B.C. Gold. IMAGE COURTESY OF THE METROPOLITAN MUSEUM OF ART. Although there is an abundance of glittering, priceless jewels and metals, “the exhibition also rethinks material,” as Chen Laurent explains. “There are pieces made of inexpensive materials, like aluminum and straw, as well as more traditional jewelry materials like gold and diamonds—sometimes with the two used together. It really becomes about craftsmanship and attention to detail.” This imperative is perhaps most thoroughly explored in the exhibitions final section, The Resplendent Body, which, in part, attempts to “redefine resplendence.” A straw necklace, bracelet, and ring made by the Songhay peoples in Mali in the 20th century is juxtaposed by a 19th century, Indian-made gold, ruby, emerald, diamond and tiger claw necklace close by. 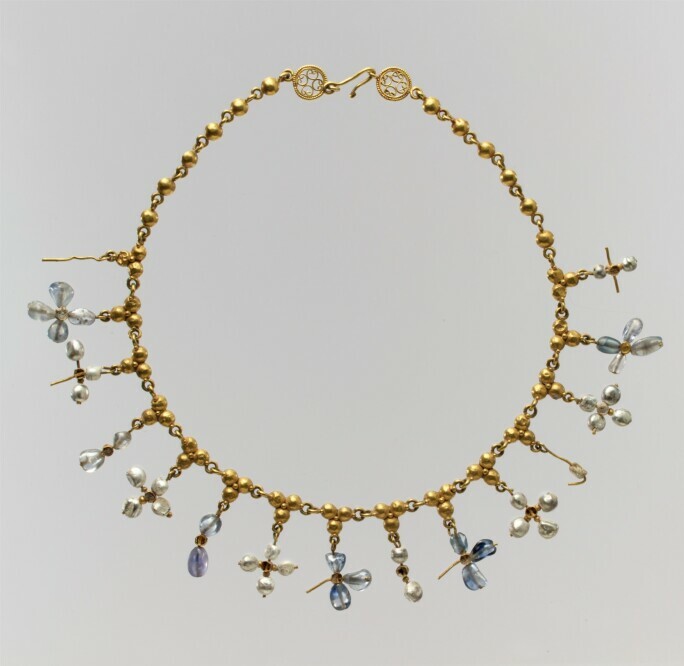 Necklace with Pendant Crosses , 6th–7th century. Byzantine. Made in probably Constantinople. Gold, pearl sapphire, smokey quartz, quartz. Gift of J. Pierpont Morgan, 1917. Image courtesy of the Metropolitan Museum of Art. Close examination, and intuitive bodily awareness are at the heart of Jewelry: The Body Transformed. The exhibition offers a comprehensive look and rare insight into the language of jewelry as it is employed across time, place and culture, bringing a singularity of meaning through its one common denominator: the human form. Firm of Castellani, Archaeological revival necklace, ca. 1880. Gold, glass. IMAGE COURTESY OF THE METROPOLITAN MUSEUM OF ART. 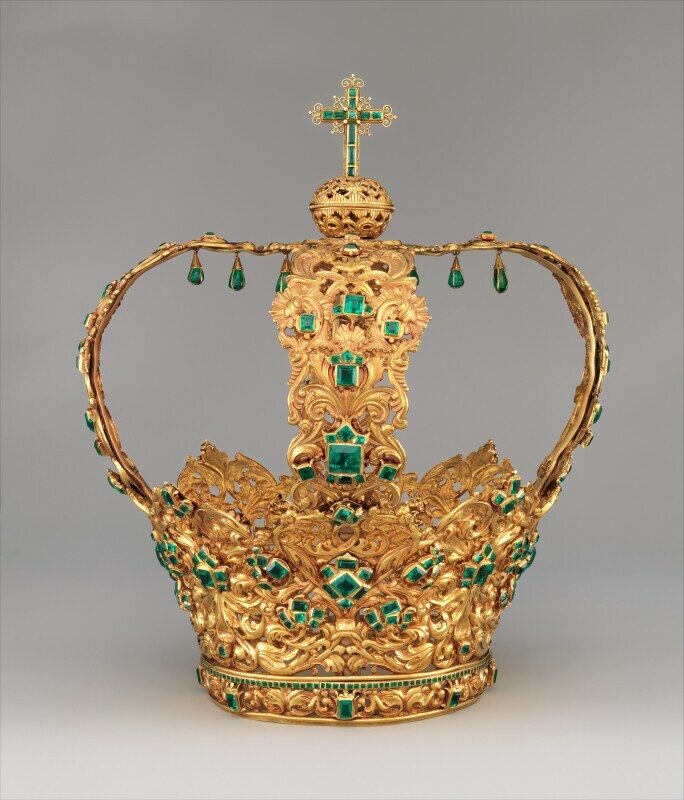 The exhibition, which closes on 24 February 2019, is not only a chance to view some of the Museum’s most precious objects, but, with jewelry being the oldest and most pervasive art form (even predating cave paintings by several millennia), also an opportunity gain a better understanding of jewelry as a historic, and often transcendent, art form. Banner image: Pair of Ear Ornaments with Winged Runners, A.D. 400–700. Moche. Peru. Gold, turquoise, sodalite, shell. Gift and Bequest of Alice K. Bache, 1966, 1977. Image courtesy of The Metropolitan Museum of Art.